MIYAKO, IWATE PREF. - A railway line in Iwate Prefecture will reach a crucial turning point next year, returning to service after sustaining heavy damage from the Great East Japan Earthquake. In March 2019 a 55.4-kilometer section between Miyako and Kamaishi stations on the of East Japan Railway Co.-operated Yamada Line, which was damaged in 2011 by the giant tsunami caused by the magnitude 9.0 earthquake, is set to go back into service after an eight-year suspension. At the same time its operations will be transferred to Sanriku Railway Co., which currently operates other lines in the region. Sanriku Railway’s 71-km Kita-Riasu Line runs through Pacific coast areas in the northern part of Iwate and links Kuji and Miyako stations, and its 36.6-km Minami-Riasu Line is located along the coast in the southern part of the prefecture and connects Kamaishi and Sakari stations. Both lines were fully restored to service in April 2014, about three years after the disaster. The reopening of the Yamada Line section will links Kuji and Sakari via Miyako and Kamaishi. Communities are increasingly hoping that will help lift spirits in the tsunami-hit areas and promote their reconstruction. While confronting these challenges Sanriku Railway is also struggling with tough financial circumstances due to a shrinking local population. But its trains, viewed as a symbol of the region’s post-disaster reconstruction, continue to operate as a vehicle not only for passengers but also for people’s hopes. Owned chiefly by the Iwate Prefectural Government and municipalities around the Kita-Riasu and Minami-Riasu lines, Sanriku Railway launched its services in April 1984 as a so-called third-sector public-private company. It took over mainly loss-making lines of the now-defunct Japanese National Railways. 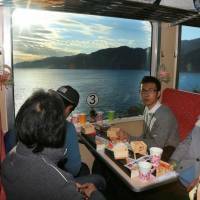 In the firm’s first business year, Sanriku Railway had some 2.64 million passengers. The company was profitable in its first 10 years, but then it started to run recurring losses in line with the decreasing local population. The passenger numbers, which fell to slightly below 300,000 in fiscal 2011 due to the March 11 disaster, recovered to 690,000 in fiscal 2014 thanks to popular 2013 television drama “Amachan.” The show, broadcast on NHK, featured a fictitious rail service — modeled after Sanriku Railway — as a key element. But passenger traffic has since begun to drop again, sinking in fiscal 2016 to 510,000 — about a fifth of the level seen in its first year of operation. As a result, the company logged a loss of ¥215.57 million ($2 million) in fiscal 2016. “Making Sanriku Railway profitable is an extremely difficult task,” said company President Ichiro Nakamura, through a bitter smile. Under the circumstances, the planned reopening of the Miyako-Kamaishi section of the Yamada Line and its transfer to Sanriku Railway from JR East has become a beacon of hope. A so-called bus rapid transit system had been proposed to offer public transport in place of the tsunami-damaged railway section, which was already bleeding red ink before the disaster. But spurred on by strong calls from local communities for railway services to continue, it was decided that Sanriku Railway would take over the operations of the Miyako-Kamaishi section while JR East would shoulder the costs for its restoration, provide Sanriku Railway with ¥3 billion in cash as cooperation money related to the transfer, and put up funds for the construction of eight new train cars for the local company. After the transfer the total length of Sanriku Railway’s train lines, which will stretch from Kuji Station in the city of Kuji to Sakari Station in the city of Ofunato, will extend to about 163 kilometers — the longest to be operated by any third-sector railway in the country. Sanriku Railway plans to unify the entire section with a new name, the Riasu Line, retiring the current Kita-Riasu and Minami-Riasu line names. “Once the Kita-Riasu and Minami-Riasu lines are connected (via the Miyako-Kamaishi section), we’ll be able to make our operations efficient in terms of trains and personnel,” Nakamura said. He believes that attracting as many passengers as possible next year, when Sanriku Railway is expected to draw public and media attention because of the operational transfer, and keeping up the momentum as much as possible afterward will be key to stabilizing the firm’s operations. Meanwhile, Masanori Yamamoto, mayor of the city of Miyako, who has been a vocal supporter of work to maintain the Miyako-Kamaishi rail section, has underscored the importance of improving convenience for local people who use the trains in their daily lives, rather than just putting energy into efforts to attract tourists. “We’d end up encountering even greater difficulties putting the brakes on the population decrease” if important transport provision for local residents is scrapped due to financial hardships, he said. “We need to demonstrate that it’s a sufficiently convenient place to live” by continuing to offer a reliable public transport system, he added. Nonetheless, there are some in the region who are less enthusiastic about the planned seamless connection of the railway service between Kuji and Sakari stations. Although Miyako has tourist spots such as Jodogahama, a scenic coastline featuring rock formations, Yamane now feels strongly that there is a need for more active promotion of local attractions. “We can’t keep saying ‘reconstruction’ forever,” Yamane said, adding that she is making an effort to focus on smiling happily at guests at the hotel. Kokoro Maekawa, a 20-year-old candidate driver who currently works on Kita-Riasu Line trains, was a junior high school first-year student when the March 2011 disaster struck. While Maekawa was attending Iwate Prefectural Miyako Commercial Senior High School, then Sanriku Railway President Masahiko Mochizuki visited the school to give a speech. That made him start thinking about joining the company. Maekawa remembers being moved to hear Mochizuki speak about how Sanriku Railway resumed part of its train operations after the disaster for free, to support the local community. Driven to do something himself to contribute to the community, Maekawa joined Sanriku Railway in April 2016. 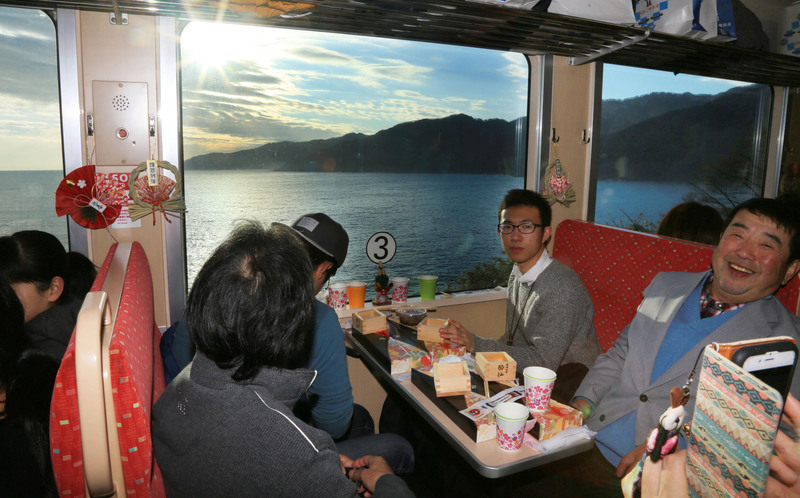 Working as a Sanriku Railway driver, with tasks that include providing sightseeing information to passengers, is “worthwhile” because it involves “direct communication with customers,” Maekawa said.